Art is everywhere at Resurrection-St. Paul School! Students are exposed to all mediums of art, including pottery which is fired in our kiln. 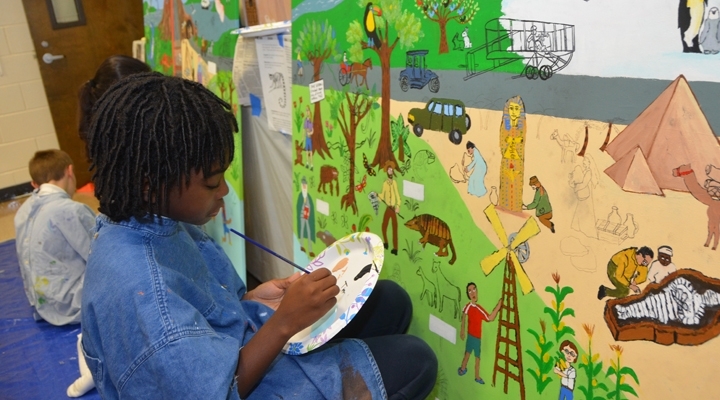 In 4th grade, all students contribute to our mural project as part of our Artist in Residence program. Additionally, every year Resurrection-St. Paul School hosts a Cultural Arts Night where the school building is turned into a gallery of still art in all forms and stages for several performance artists. Every student in the school will have at least one piece of still art on display and many students will perform a song, dance, poetry reading, or dramatic act for visitors. This is a free event for all to enjoy. In third grade, students will participate in all aspects of a stage performance. Whether a performer, backdrop artist, or technical crew member, all students are involved and engaged in the play. Students hold 3 showings, 2 at school for their classmates, and 1 in the evening for the public (and parents). Many classes also use "reader theater" to enhance the English Language Arts curriculum. Students in music class have exposure to several instruments including recorders, xylophones, and hand bells. In addition to music class, we have a student choir and an award winning instrumental band program. The liturgical music at our school masses are always lead by students.